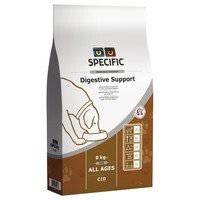 Specific Digestive Support CID Dry Food for Adult Dogs is a complete and balanced diet developed specifically to help support dogs suffering from digestive problems. Made with easy to digest ingredients and a low fibre content to maximise digestibility and increase nutrient absorption, Specific Digestive Support is optimal for patients with gastrointestinal conditions such as acute and chronic diarrhoea, vomiting and/or flatulence. High Digestibility: Compensates for decreased intestinal enzymatic activity and ensures an optimal uptake of nutrients. Rice, Dried Egg Products, Fish Meal, Maize Starch, Minerals (including Zeolite), Dextrose, Pork Fat, Hydrolysed Poultry Protein, Vitamins and Trace Elements, Fish Oil, Psyllium Husk, Yeast (Source of ?-1,3/1,6-Glucans and Mannan-Oligo-Saccharides), Powdered Cellulose, Beet Pulp, Methionine, Fructo-Oligo-Saccharides, Yucca Extract. Antioxidants: EC approved additives: BHA, BHT, Propyl Gallate.